And, while Marvin is best known for his icy tough guy roles, veteran Hollywood writer Epstein provides us with a portrait of a much, deeper, more complex individual who took great risks in his acting and career, often joining forces with relative unknown directors of the time like John Boorman and Sam Fuller. Yet, although voted the leading male action star in 1967, and winner of an Academy Award (Cat Ballou), very little is known of his personal life, his family background, his experiences in WWII, his relationship with his father, family, friends, wives, and his ongoing battles with alcoholism, rage and depression, occasioned by his postwar PTSD. 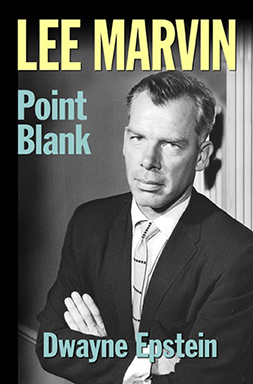 Now, after years of research, interviews with family members, friends and colleagues, and complete with rare photographs and illustrative material, LEE MARVIN: Point Blank will provide a full understanding and appreciation of this acting titan’s place in the Hollywood pantheon in spite of (or perhaps because of) his very real and human struggles. Moreover, this biography provides a penetrating psychological and sociological analysis of Lee Marvin and his role in shaping the image of the violent male in modern film. By exploring Marvin’s family history and his formative years as well as the harrowing combat that Marvin was involved in the Pacific campaign in WWII, Epstein gives us a portrait of a man shaped and shattered by violence, yet one who, having been intimately acquainted with it, could bring it home to the film audience with an intensity and realism previously unseen in modern cinema.